The College of Arts & Sciences is home to a new undergraduate research symposium for students across all scientific disciplines within and outside the college. Chemistry professor Robert Doyle, Laura J. and L. Douglas Meredith Professor of Teaching Excellence, is organizing the inaugural Meredith Symposium, to be held on Oct. 22. “The symposium will showcase research going on across the sciences—from philosophy of science through physics, chemistry, forensics, engineering, materials science and beyond. It’s really a full gambit of research investigations,” Doyle says. Undergraduates who have conducted one full semester of research and are eligible for participation in SU’s Women in Science and Engineering or McNair programs are encouraged to apply before 5 p.m. on Friday, Oct. 7, To be considered for inclusion, students simply need to submit a 400-word abstract of previous research on the Meredith Symposium website. 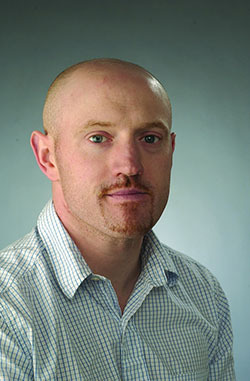 Doyle was named a Meredith Professor in spring 2016. “It’s a huge honor to be in the company of the other recipients—you can see many great teachers on that list,” he says. An endowment from the prestigious professorship supports the symposium, as well as $2,500 prizes for the symposium’s two best speakers, who will also be named Meredith Scholars. The prizes will fund the students’ travel, along with their research mentors, to present their research at a national conference of their choice. “The awards are set up to both support and showcase the students’ research nationally, as well as make sure they’re mentored and supported from day one, all the way through a national conference,” he says. By focusing on two populations that are underrepresented in many scientific fields, particularly at the faculty level, Doyle hopes to increase diversity in science. “The symposium is a way of recognizing that there are more barriers for some student groups than others—we really want to show that we are behind them and their science,” he says. The Meredith Symposium will take place on Saturday, Oct. 22, from 9 a.m. to 3 p.m. in Breed Lecture Hall (room 105) of the Life Sciences Complex. More information, including details on two keynote speeches from Syracuse alumni Nerissa Viola G’09 and Anna Kahkoska ‘13, can be found on the symposium’s website. “Even if students think they don’t fit they should still apply—we’re going for eclectic here, we want to see many viewpoints,” Doyle says.